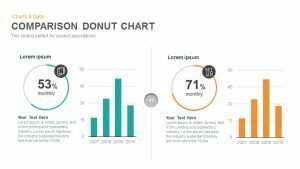 8 process Circle process infographic template for PowerPoint and Keynote is ideal for presenting sequential data. 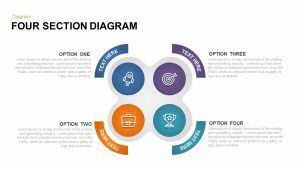 Other than using similar process diagram like arrow diagrams, timeline diagrams, pyramid diagram; Our circular process diagram template can be the ultimate choice. 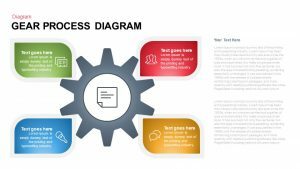 These circular process diagrams illustrating how sets of variables can create a process or system. 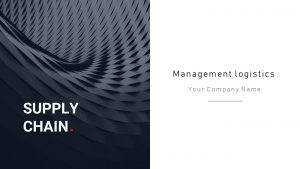 These templates can demonstrate certain flow processes like developmental stages, production process, marketing practices. 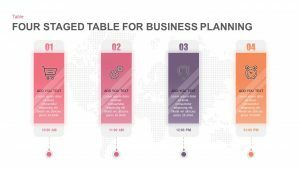 The PPT templates are visually appealing and are comprehensible for any kind of audience. The presenter can give a structure to their sequential data. As the circle is the oldest shape known, it will create a genuine and lasting impression on the audience. 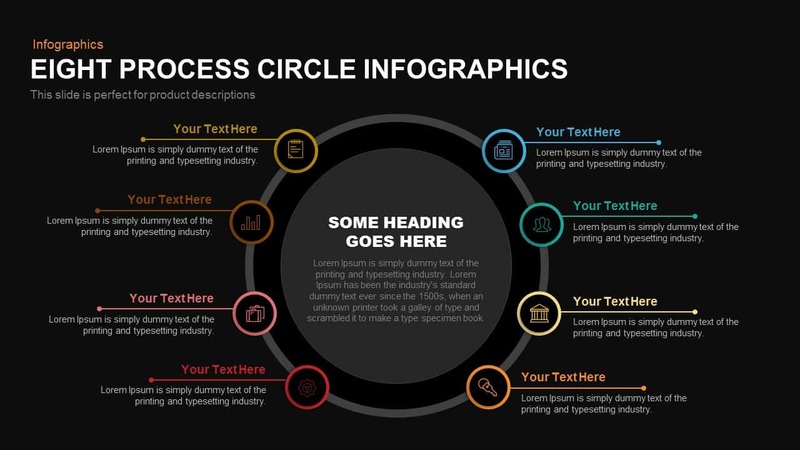 Our eight process circle infographics PowerPoint template comprehends of two layers. The inner circle is where the presenter can showcase the topic or heading of the presentation. The gradient effect in the inner circle gives an eye-catching look to the shape. The outer ring incorporates eight processes, each molded in a circular shape. 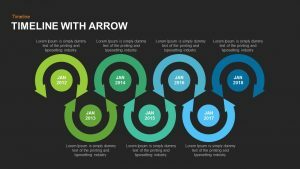 Each circular process shapes are glossed in a vibrant color scheme with infographic icons. 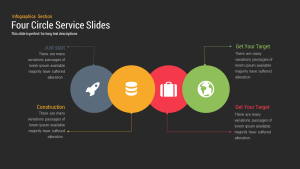 Our PPT slide gives two background color options. They can opt for one version as per the presentation theme. The template is designed with multiple customization options. 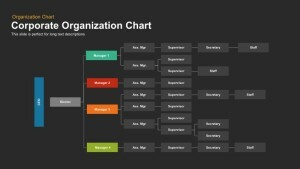 The presenter can change background colors, add/delete processes, add new brilliant icons, etc. Each text area is highlighted with a colored line which enhances the look of the text areas. 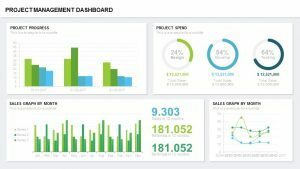 The template is highly useful for presenting activities like marketing, sales, customer feedback, follow up process, etc. 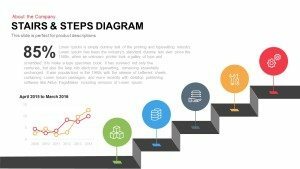 Processes with constant repetition such as improvements, change in management can be visualized using the process-circle-infographics template. The presenter can opt these templates as a metaphor for teamwork and can design effective strategies. 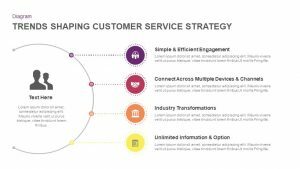 Our eight process circle diagram encompasses attractive visuals which can deliver the information that can easily be interpreted by the audience, clients, colleagues, etc. 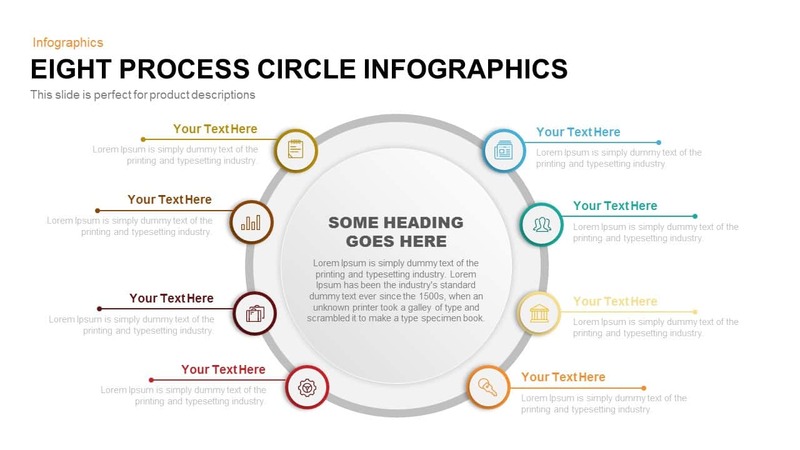 This process circle infographic template is compatible with PowerPoint and Keynote versions. 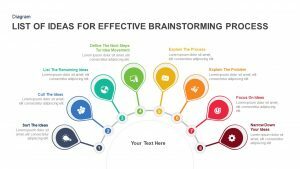 You can access more 8 Steps Templates here Grab the free ppt now!